Ask and answer the following questions before printing any test. Improve the test, then go ahead to print it. 1. Is the purpose of the test clear? Is it a unit, month or end of term test? Is it to test what? 2. Does the test match the test specifications? Are number and types of questions, distribution of marks, length of the reading text and time allowed as in the specifications? 3. Does the test content match the syllabus content? Are the vocabulary, structures, functions, reading and writing questions in the test included in the syllabus? 4. Do the test questions match the objectives of the syllabus? Do the test items measure to what extent the objectives are achieved? 5. Do the test items cover the cognitive levels? Do the test items encourage students to show understanding, apply what they’ve learned, analyze, combine and evaluate? 6. Is the total time allowed clearly mentioned? 7. Are the marks for each question clearly written beside the question? 8. Are instructions clear on what exactly students have to do? 9. Are instructions grammatically correct, spelled correctly and written in simple, clear language? 10. Are the format and layout clear and easy to follow? Are the pages and all the questions numbered? Is the font familiar and easy to read? Are the texts and spaces well distributed? Are the pictures and tables clear? Are the instructions clearly distinguished from the questions? Are all relevant questions on one page? Is there enough space for students to write their answers? 11. Are the questions organized in appropriate order from easy to difficult? 13. Are the questions in the right level according to the students’ level? 14. Is the answer key available in a separate paper, correct and complete? 15. Is there only one correct answer for each MCQ? 16. Are all acceptable answers included in the answer key? 17. Is there a clear rating scale for marking writing question? 18. Are the marks easy to compute? 19. Are all questions free of bias in any way? 20. Is the test as a whole free of any offensive language? It is usually made by the head teacher, administration, or the supervisor to select a teacher to construct the test. Or the teacher himself decides to make and provide the test as a formative kind of assessment of students’ learning. 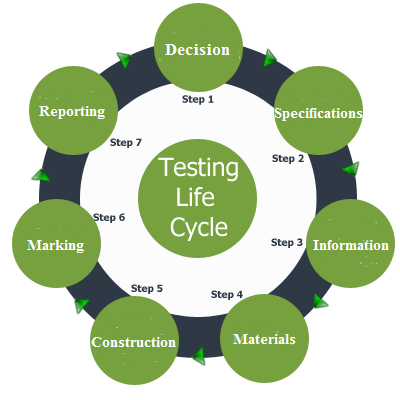 It is related to have and get a look at the specifications of the test that should be followed to produce the test in its final version. In this stage the test provider collects information about the students (the test takers), their levels, abilities, points of weakness and points of strength as well and about the content on which the test is based, its objectives and outcomes, the items that have been taught and the teacher focused on and the items that have not been taught or have less focus in teaching. Here the test provider should write sample questions for the test following the specifications. As many questions as possible should be written down on a separate paper in this stage. According to the information collected in stage 3, the test provider should select from the questions written in stage 4 those questions which are suitable and use them to construct the test according to stage 2. Marks should be provided besides each question in the test as well. After conducting the test, it should be marked and graded. Marking means providing accurate marks for each students while grading means putting the marks into a meaningful category so that the test results can be understood. In the final stage, test takers and others who concern should be provided with the test results and any other information needed for an appropriate interpretation.